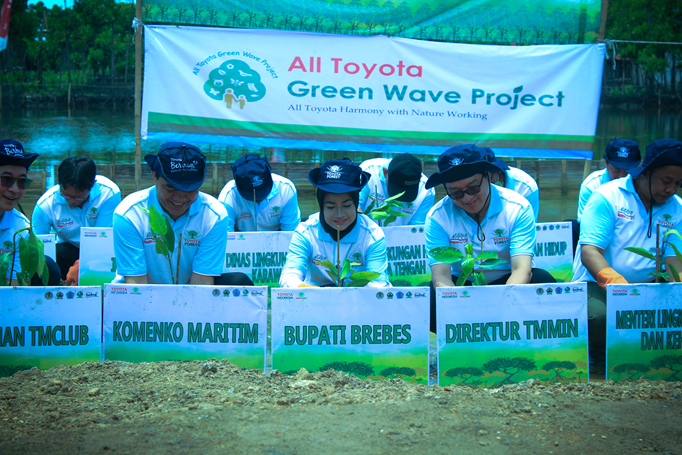 Brebes, Central Java - On March 1, 2018, Toyota Indonesia through Toyota Forest Program again showed its concern for the surrounding environment by doing reforestation activities "Mangrove for Life" which has been doing since 2013, in order to actualize the aforestation on the North Coast Coast of Java Island. On this occasion, Toyota Indonesia planted 70,000 Mangrove Tree in 6 hectares of land located in Mangrove Pandansari, Kaliwlingi, Brebes, Central Java. The selection of this location is based on the success of local communities to rehabilitate their villages that affected by abrasion so that it becomes a mangrove conservation area that is abrasion-free. Besides the company policy to plant one tree for each car produced by PT. TMMIN or so-called One Car One Tree Policy, this initial planting is also part of Toyota Indonesia's target to plant and maintain 300,000 mangroves in a number of areas along the northern coast of Java spread along the Thousand Islands (DKI Jakarta), Karawang, Brebes, Batang, Kendal, and Surabaya in 2018. The selection of mangrove trees has the benefits of carbon offset (absorbing carbon in the air), growing biodiversity and contributing value added to surrounding communities through Income Generating Activity (IGA). In accordance with the target set by Toyota Indonesia to aforestating the coast of Java, the planting of ten thousands of mangrove trees is expected to overcome environmental problems in the midst of extreme weather conditions that currently hit Java and surrounding areas.